There are only eight weeks left for Cub Scouts to earn belt loops and pins before the Academic and Sports program ends. Trevor has made excellent progress since my last update. 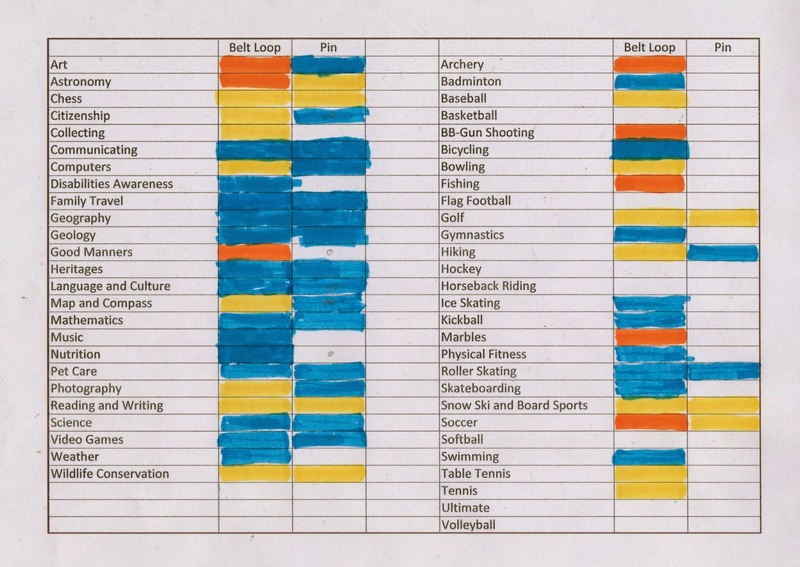 As you can see, he has finished all 25 of the Academic belt loops, as well as 21 out of the 28 Sports belt loops. He's also made great progress with the Academic pins. With six days off school for spring break, he was able to finish up a handful of pins where he had only one requirement to go. One of those was the Language and Culture pin. The requirement was to learn how to write the numbers 1-10 in Chinese. This was an activity I did with my 4th and 5th graders back in the day, so it was simply a matter of going through my Chinese New Year file to pull out the handout. Then I gathered a roll of paper, a brush, and black paint. I showed Trevor how the brush work is done, then he gave it a go. He really enjoyed it and proudly displayed his completed "scroll." It's amazing how many times over the years I've been able to turn to my teaching files for something Trevor needed for Scouts. It makes it somewhat easier to justify having kept it all for almost 9 years (so far). It's so much fun pulling out an activity that I enjoyed teaching my students to share with Trevor. Awesome job Trevor!! Very cool!!!!!!!!! Congratulations, Trevor! You will get your loops in no time. The loop thing is new to me. Didn't have that in Scouting when my brother was in it. We were a scouting family. My dad and mom were both troop leaders.